Porto Koufo is a small, fishing place perfect for real relaxation and enjoying in peace. The place is only 2km away from the bigger place Toroni and has got the biggest natural harbour in Greece, as long as 1,5km. Porto Kuofo means “the deaf harbour” when translated because it is so well preserved that a single sound could not be heard. Porto Kuofo is an ancient port which was meant for different purposes. Nowadays, this port has got anchored numerous boats and canoes, mainly fishing ones. Porto Koufo has got a long sandy beach. In the arranged part, in front of some hotels there is a longish shoal, whereas in the unarranged part the shoal is shorter and the depth appears sooner. The beach is not crowded due to a small number of nearby accommodation properties and the fans of a peaceful vacation can completely let it go and just enjoy their time here. Behind the beach is the road and there is enough space for parking, so you can leave your car just beside the beach. On the beach there is a canteen with fast food and refreshing drinks. In this place there is not a lot of traffic, commotion and nightlife, and still there are enough facilities for a good vacation (great taverns, mini-markets, a gas station, fishmongers). The place has got a big promenade beside the harbor and sea, a lot of objects to rent since it is a big, peaceful and clean place, windless and cuddled among the hills of the bay. 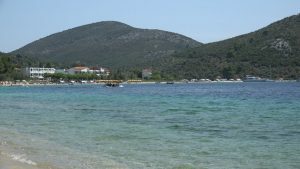 Although there are not a lot of tourists staying in the very place, Porto Koufo turns into a completely lively place in the evening as the tourists from all over Sithonia who want to try amazing specialties in taverns, which are widely known, just flock here. Waiting for a free table in some taverns is a common situation. Porto Koufo is only 2km away from Toroni, and Kalamitsi is only 12km away so a lot of facilities that this place offers are easily accessible to all the guests of Porto Kuofo. Transfer Thessaloniki is the best way to discover this beautiful places! We are here to transfer you from Thessaloniki Airport to Porto Koufo. Your transfer, is our pleasure!